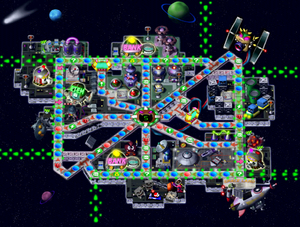 Space Land is a space station in Mario Land from the game Mario Party 2. In Space Land players are dressed as astronauts, and are members of the Space Patrol. 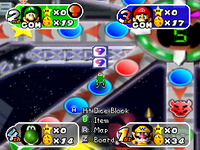 Players who land on the Happening Space make a Thwomp or a Whomp in a space cruiser chase that player, and any other players in the way, to the other side of the board. However, there is also a group called the Snifit Patrol that assists a player if they pay five Coins. Upon doing this action, a Snifit (or possibly a Snufit) will set up a speed trap. If players land on a Happening Space with a Snifit on patrol, the speeder would chase them down as usual, but then the Snifit chases them down the bottom or top side of the board, with any players in the way being chased as well. The main part of this board, however, is the Bowser-faced junction with the LED in its mouth. Every time it is passed by, it counts down one unit. It always starts at five, and when it reaches zero, the villain of the board, Black Hole Bowser, would fire the Bowser Beam from his satellite, located at the top right corner of the map. Any players that get caught in the blast (which fires in a straight line along the diagonal path across the board) lose all their coins. The Item Minigame is Hammer Slammer, and the Duel minigame is Time Bomb. At the end of the game, a red Koopa Troopa comes and alerts the players that Black Hole Bowser is attacking the station. A cut-scene then shows a bunch of Koopas running away, when one of the green ones falls over, and sees Bowser right in front of him. He traps the Koopa between his two lasers, until the winner of the game comes to confront him. They fire their laser at Bowser, but it doesn't work. They then try to get behind Bowser to attack, but he keeps blocking. The winner then runs around Bowser really fast, making him dizzy, and allowing his backside to be exposed and zapped by the winner. Black Hole Bowser is sent flying, leaving the winner to congratulate by the other players, Toad, Koopa, and the Star. This page was last edited on September 1, 2018, at 22:04.